You are here: Home / Money / Business / $15 Minimum Wage, If So Who Will Pay It? 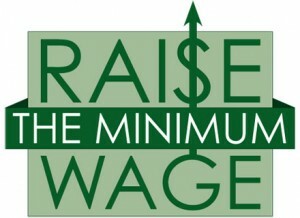 $15 Minimum Wage, If So Who Will Pay It? The right is opposed to a $ 15.00 minimum wage because it will lessen their profits.Unchecked capitalism,represented in contemporary employment laws from state to state, which legally rewards the wealthy much more than the poor, will always skew in favor of the wealthy. American workers shouldn’t sell the sweat of their labor so cheaply as is being done now given the laws in place for the wealthy to recover their business losses. The entire legal concept of employer employee relationship, which varies from state to state,but always legally favors the wealthy, should be changed to a more contractual business arrangement that affords the worker more legal rights, and privileges. A more pragmatic understanding of the employer employee relationship can be had by critically examining the IRS 1040 Form, and all of its accompanying Schedules which clearly reflect the fact that America is a business orientated country. Simply put, we are a country of merchants, and our employment laws are orientated to benefit the employer.Even President Trump has a legal right to write off his business losses, and recover a percentage of his initial investments which negates the idea that he is a business loser.You are not a loser if you are allowed to legally recover a significant amount of your business investment losses.Members of the so-called left would be better off to go into business for themselves,and take full advantage of their legal tax laws than content themselves to be employees of the middle and wealthy classes.Personally, I think that the IRS is doing a great job in simplifying tax laws so lay persons can understand them.